And those same communities often already are located among environmental hazards like trash incinerators, fuel storage tanks and the toxic remains that come with them. PORT Park, in Chelsea, is located at the site of a former asphalt storage facility. "Just on the other side of this beautiful park is Chelsea's neighborhood most impacted by environmental injustice," says Roseann Bongiovanni, executive director of the group GreenRoots. "So it's the lowest income, most ethnically diverse, most densely populated neighborhood in the entire city of Chelsea and the one that is located the closest to the environmental impacts." Bongiovanni points to the various industrial sites visible from the park, all situated along a three-mile stretch of the Chelsea Creek. "That is the storage depot for 100 percent of the jet fuel that's used at Logan International Airport," she says, gesturing toward a cluster of massive white tanks. She continues: "Seventy to 80 percent of the region's heating fuel, so that's all of New England, and road salt for 350 communities in the New England area." And just down the way is the New England Produce Center, which requires a steady stream of trucks coming and going from the facility, leaving behind emissions. 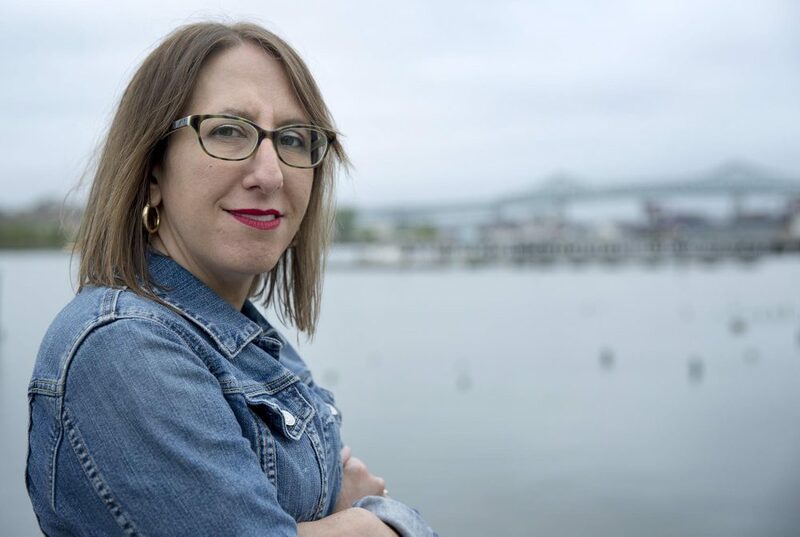 "So you'll see in Chelsea that we provide a lot of regional benefits but those burdens are on the backs, essentially, of Chelsea residents," Bongiovanni says. Twenty-one percent of Chelsea's residents live below the poverty line, and 60 percent identify as Hispanic or Latino. The creek is also one of 10 designated port areas in the state — places set aside to ensure industries that are dependent on waterways have a place to do business. Those industries may bring jobs, but they also bring pollutants. And, because they're located at the water's edge, the sites up the stakes when it comes to sea level rise. A city of Chelsea flood map shows that many of these facilities will be threatened by flooding by the year 2030. 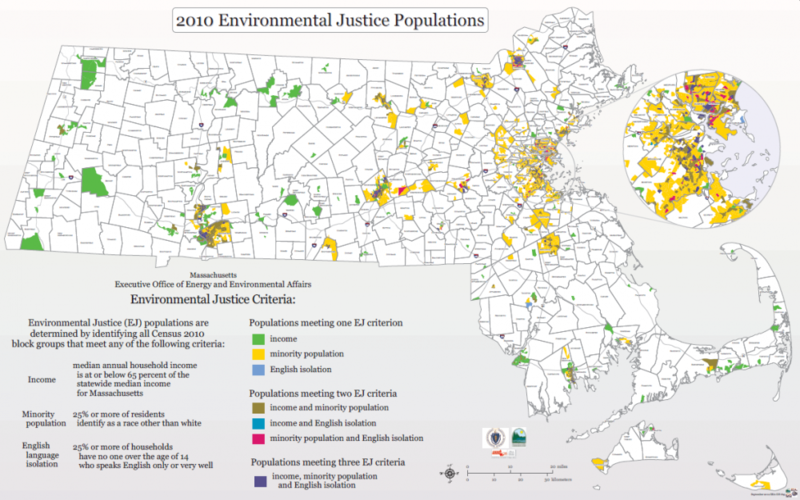 Daniel Faber is the director of the Northeastern University Environmental Justice Research Collaborative. With projected sea level rises for the area of anywhere between six and 15 feet, Faber says the risk for catastrophic failures at sites like Chelsea's fuel storage tanks are high. "You're looking at the flooding of some very significant areas of Chelsea and Boston, and of course, you know, the impacts are going to be felt in some of the poorer segments of both Chelsea and Boston that currently lack protections," Faber says. In a 2005 study, Faber concluded that: "[I]f you live in a white community, then you have a 1.8 percent chance of living in the most environmentally hazardous communities in the state. However, if you live in a community of color, then there is a 70.6 percent chance that you live in one of the most hazardous towns." Faber says he's updating his data for a new report. "People talk a lot about communities of color, immigrant communities, low-income communities being, you know, hit first and worst," says Kalila Barnett, who was the longtime head of the Roxbury-based Alternatives for Community and Environment, or ACE, and who's now working with the Green Justice Coalition. Barnett explains that given the historical injustices experienced in low-income communities of color, it shouldn't be a surprise that those communities are already at a disadvantage when it comes to preparing for, and responding to, a changing climate. "We haven't had the same access to homeownership opportunities, haven't had the same access to quality education," Barnett says. "And so if you overlay climate change, when there's a shock or a crisis, if people don't have stable lives already, then they are going to be even more behind and even more disrupted because they can't bounce back from that crisis." "We can pretty much predict who's going to disproportionately suffer from these issues, whether it's the snowstorm, whether it's climate change impacts, whatever the issue is, it generally, exponentially, makes worse what people are already dealing with," Martin says. The city's new resiliency plan calls for neighborhood-based preparation for climate change, especially in environmental justice communities. Martin says addressing the underlying causes of environmental inequities is also an important part of preparing for climate change. "Environmental justice is one of those issue areas where what we're really talking about is racism and classism, right," she says. "And so I think what's beautiful about resilience is that it's the recognition that what's happening in communities on a day-to-day basis is what determines what's going to happen when there's a disaster." 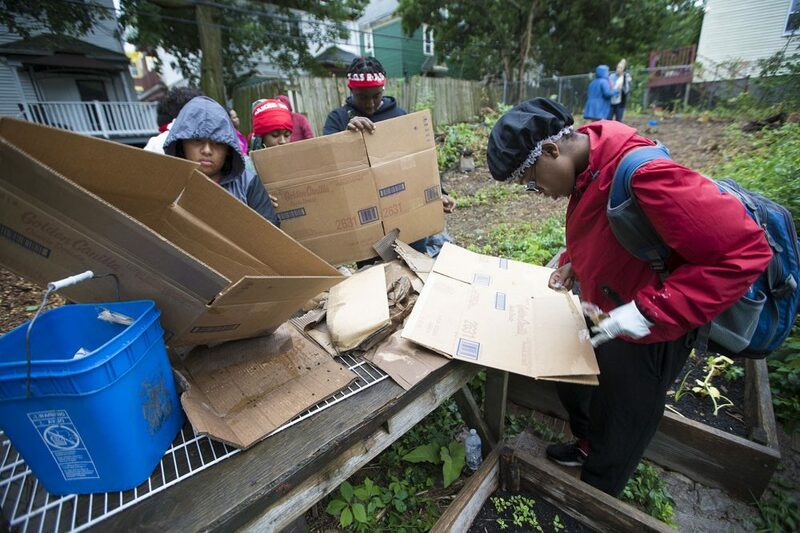 In a vacant lot near the Dorchester-Roxbury line, a dozen young people, ages 15 to 21, are learning how to regenerate new soil from land that's been tainted by metals and lead. 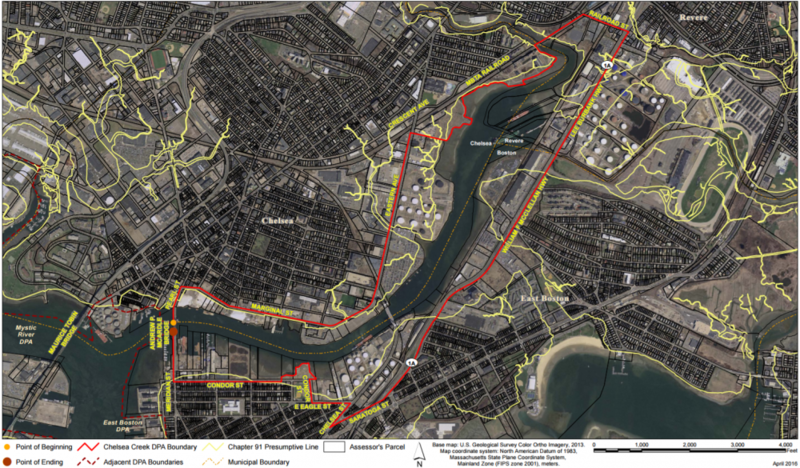 It's a common obstacle in Dorchester, where old factories once released toxins into the air and ground. Collard greens and lettuce now grow in raised garden beds, and the hope is to eventually plant fruit trees in the community garden, a project of the Boston Food Forest Coalition and ACE. 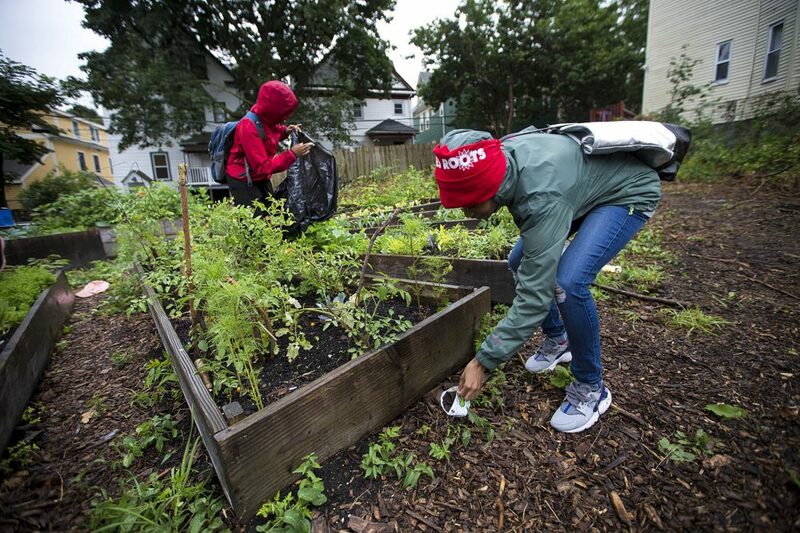 A recent city report on preparing for climate change says Dorchester is especially vulnerable to heat exposure and increased stormwater flooding, so this garden serves many purposes. It will help remove heat and pollution from the air, it can reduce stormwater runoff, and it will feed the community. Sixteen-year-old Keema Green lives in Dorchester and says working on this garden, for her, embodies what it means to be resilient. "We have these bad things and things really only get worse for us, but to take it back and make it ours and to be our sustainability in our own communities, it just, it just shows our strength," she says. "Like, what it means to be a community of color working towards survival." So on this day, in this garden, community members are working toward survival and planting a vision for the future.